Our beautiful Lenten prayers and reflections offer you the opportunity to reflect on your own or in your parish. We pray that we may allow our hearts to be touched this Lent by the cry of our sisters and brothers living in poverty. Our Lent calendar is designed to accompany you on your spiritual journey, with daily prayers and meditations from Ash Wednesday to Holy Week. Give yourself some quiet time for reflection each day to draw closer to God in prayer. In Pope Francis's words, Lent is a perfect time to pause, and "leave behind the unrest and commotion that fill the soul". Say our grace at mealtimes during Lent, giving thanks to God who nourishes us with his love and praying for justice for those who are hungry. Use our intercessions in your parish for Sundays in Lent. 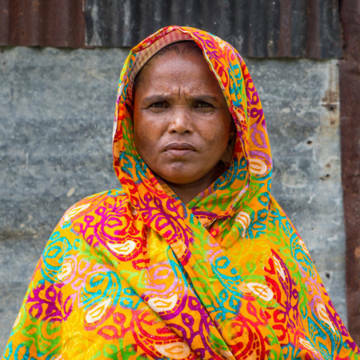 The Lent grace shows a photo of Mahinur, a woman in Bangladesh. She has a disabled husband and son, and is struggling to provide for them all. Earlier this year, the river dried up and now there are no fish for her to catch. Meditate on Christ’s journey to the cross, following themes of justice, poverty, mercy, friendship and hope. Our Stations of the Cross reflection, accompanied by powerful images from around the world, is perfect to use in your parish or community, or as a private Lent devotional journey for Lent. There are also accompanying leader's notes to help you to organise the Stations in your group. Thank you for your kind generosity and for your prayers, which are at the heart of all we do.